Who likes to stick to the 'norms' of fashion? Not me! I love playing around with styling and textures, and sometimes I even dabble in a bit of colour. I love how fashion gives me creative freedom and the ability to express myself. I think it's fun to try and mix things up and break away from 'traditional' style. I like to break away from the 'norms' of everything really. I don't like being sectioned off into one little description that I'm not allowed to break away from. We're changing creatures, we need to be allowed to experiment and have fun - whether that be in everyday life or with our style! Something that is normally considered a more 'casual' piece, is anything that comes under the 'denim' genre. Denim is always seen as something you'd throw on to create a day-time look or something a bit more 'street-fashion'. The thing is though, why does it have to be? Just because most people wouldn't think to grab for a denim jacket or a pair of jeans for a more formal occasion, doesn't mean that you can't. All style is personal, and if you feel amazing and confident in denim, then you bloody well wear it! We have the tendency to want to 'fit in' and we fear rejection. The world tries to shape us to be a specific type of person or to look or dress in a certain way. Conforming to the norms just stops your creative side from being free - it stops you from expressing who you are and even just finding out who you want to be. I don't think people realise just how much fashion can be a brilliant way of expressing feelings and showing who we are as human beings. We need to stop worrying about what everyone else is thinking - you do you. Don't follow the 'rules' just because that's what the world wants you to do, it's so much more fun to break free and be your own person. And so, if that means you love a good bit of denim in your outfit, then so be it! Anyway, denim is such a fun piece to style with, so why not style it for every occasion? I think it's got such a lovely sense of 'character' about it - especially distressed denim or anything with a little added extra, like embroidery. I feel like the denim you choose to wear can really show who you are or what mood you're in. New Look have asked me to work with them on their Denim vs Formal campaign. For this look I really wanted to challenge the 'norms' and style some distressed denim for a more formal/evening occasion. Sometimes, although slipping on a pretty dress or a frilly skirt can make you feel amazing, it's nice to create a look that's a little more edgy and fun for a formal occasion too. I decided to style this amazing pair of Black Washed Ripped Knee Mom Jeans along with this fabulous Silver V-Neck Metallic Sleeveless Bodysuit and this White Satin Trim Blazer. I thought that the silver bodysuit added a touch of 'glam' (something you'd normally get with a glitzy dress or skirt) and the white blazer contrasted perfectly with the ripped jeans. 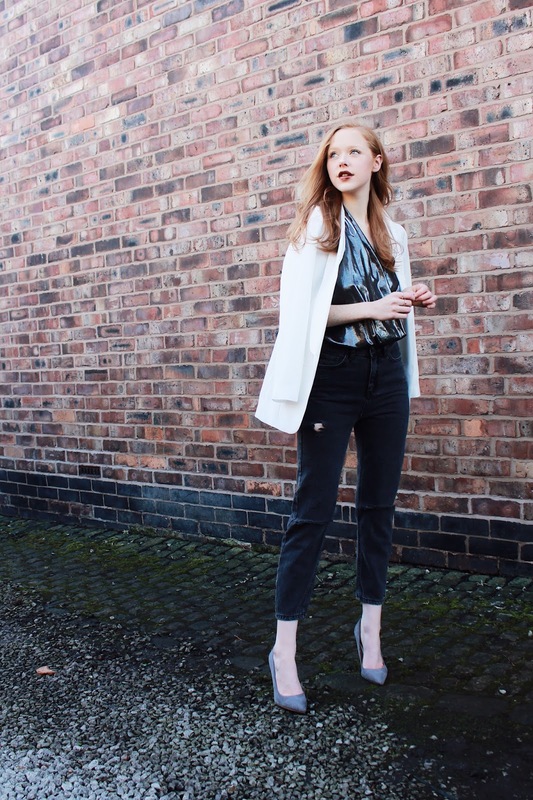 The mom jean has such a casual style, yet paired with a blazer and sassy top, like I've done here, they work perfectly for a more 'formal' look. The look is a total oxymoron and I love it! It just goes to show, there's nothing wrong with breaking out from the 'norms' and doing a little experimenting. So today, my challenge for you is: break out from the norm. Try something new with your sense of style (or anything else for that matter), do something you wouldn't normally do and let yourself be as creative as possible. Fashion should be fun and we shouldn't be tied down to one particularly genre of style or be told what we can and cannot wear for specific occasions. You could even try creating your own denim/formal look if you fancy. Or if you'd simply like to recreate this one, then make sure you head to the New Look website! I absolutely loved this post, I totally agree when you say break away from the norm and try something different! I like putting random bits together and styling things differently each time I wear them to mix them up a bit! Best thing about fashion, you can play around with it. I love the way you styled the jeans, you look lovely!